Over the last few weeks we have begun to use a product new to us in the kitchen, not that Maine shrimp is anything new, but finding a source for Maine shrimp that is sustainable and traceable is getting harder and harder as demand is reaching all time highs and supply is depleting. But we are confident that we have found a source that cares about preserving the stock and the ocean. St. George peninsula locate mid coast Maine, you will find the small fishing village and port of Port Clyde. Port Clyde sits at the confluence of Muscongus and Penobscot bays, and provides key access to myriad fishing grounds. The village is steeped in the fishing industry, going back some 200 years. This heritage continues today with shrimp as well as ground fish such as haddock, flounder, cod, pollock and hake although much less in scale than 200 years ago, the fisherman remain as true to their catch as the they did then. Roughly a dozen fishing vessels make up Port Clyde’s small fleet, the last between Portland, Maine and the Canadian border. 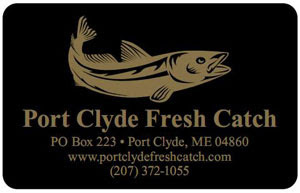 Determined to preserve their heritage, their community and the resources the fisherman of Port Clyde Maine use environmentally sustainable fishing methods. They guarantee 100% supply-chain traceability, a return to the traditions of America's past — fresh, wild-caught seafood that we the customer can trace to the source.